I love authors who make good on their promises. When I reviewed The Warbler Guide back in June, I noted that the one thing that would make this book perfect was an audio collection of the warbler chips and songs illustrated in the book by graphical illustrations called sonograms. I also noted that the authors, Tom Stephenson and Scott Whittle, had promised “a library of warbler songs and sounds” in early July. Well, sure enough, in early July The Warbler Guide Song and Call Companion became available from the Cornell Lab of Ornithology Macaulay Library. Princeton University Press graciously made the Companion available for review. 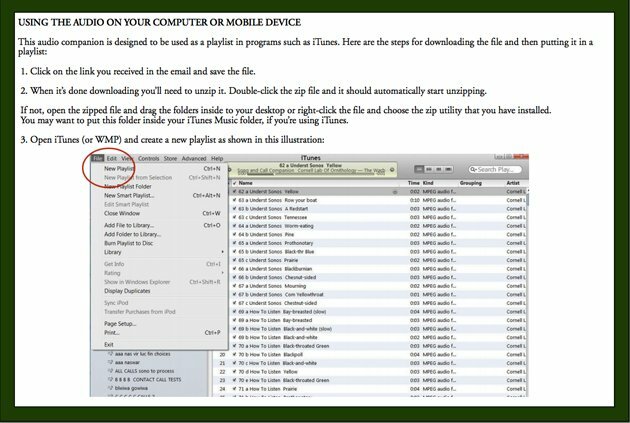 The first step was to download The Warbler Guide Song and Call Companion files, which are in MP3 format, from the Macaulay Library website to the iTunes program on my computer. I was a little nervous about this, being media-files-challenged. 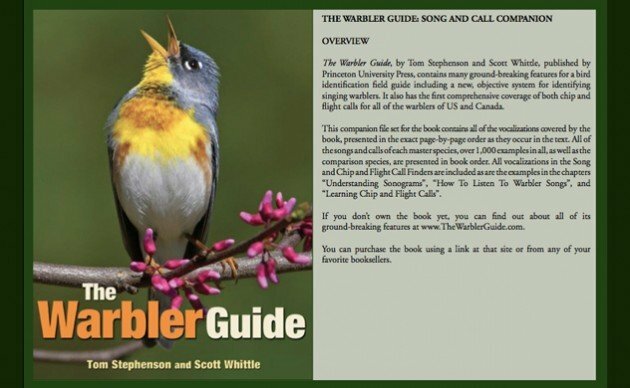 And, it looks like I’m not the only one, because Scott Whittle, one of the co-authors of The Warbler Guide, has posted a video, Sound and Call Companion, giving step-by-step lessons on the downloading process. It turned out it was relatively simple process, once I ceased being scared of zip files. You can also learn how to do the downloading from the Companion pdf, which is available free from Princeton University Press and from the Macaulay Library (the link to the pdf on the Macaulay Library website was not working the day I wrote this review, this seemed to be a website-wide problem and hopefully temporary). The Companion files should be downloadable to other mobile devices, just be aware that the focus here is on using iTunes. The Song and Call Companion consists of 1031 files of warbler calls, chip notes and song and an introductory file. The files are brief, ranging from 1 second to 10 seconds, most of them 3 to 5 seconds long. (An exception is the 39-second vocalization of Yellow-breasted Chat, defined as a “similar non-warbler species” in the book.) This works very well when you are playing the files as you read the book. I found it useful to have iTunes on repeat, so I could hear each file at least two times before going on to the next one. I did have a problem with low sound, and I’m not sure if this is a problem with my computer or the files. It definitely is an example of the tribulations of reviewing media! Transferring the files to my phone, which is quite loud, easily solved the problem. High-quality audio speakers would be another option. The files are listed in book order, numbered sequentially, and named by the page of the book, its order on the page, and name of chapter. Every single sonogram in the book is vocalized here, including the chip and flight notes in the upper right-hand corner of each species account (vocalization section, see page below), the songs in the Warbler Song Finder Charts, the chips in the Chip Call Finder, and the flight notes in the Flight Call Finder. The sonogram for each vocalization can be viewed in the “space” usually used for album cover art. (And, I’ve learned through Scott’s video that I can double-click on the small picture on top to bring up a larger screen.) This way, if you want to play the vocalizations without the book, you can “see” the sound as you play it, very useful for memorization and even, I imagine, study moments in the field. I’ve been having a lot of fun with the Song and Call Companion. Having spent too much time in the field trying to figure out if I’m hearing a Pine Warbler or a Chipping Sparrow, I’ve been focusing on my trills skills. This mainly means looking at and listening to the Pine Warbler chapter, a treasure chest of Pine Warbler, Palm Warbler, Yellow-rumped, Worm-eating, Chipping Sparrow, Swamp Sparrow, and Orange-crowned Warbler trills, each illustrated by a sonogram. I sometimes play the trills on iTunes as I study the book; I sometimes just use my iPhone, utilizing the sonograms depicted in the album cover space. 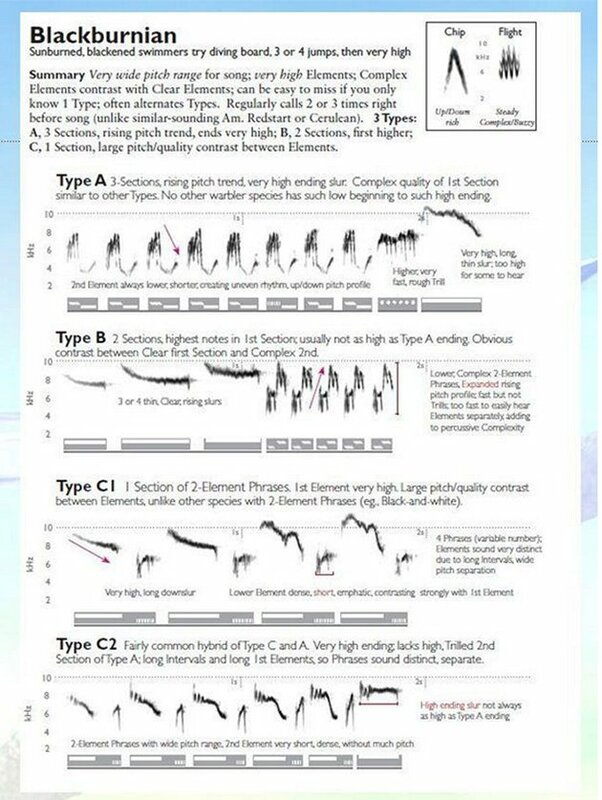 Stephenson and Whittle state that sonograms offer an excellent way to learn bird vocalizations because they are based on objective criteria, showing the structure of the chip or song and differences in pitch, frequency, and harmonics that many of us cannot hear. Sonograms don’t have the subjectivity of sound transliterations or those mnemonics that birders tend to either love or hate. It’s taken a few days to get used to them, but I now have to agree. Going through the trills, comparing the simple marks of a Pine Warbler trill with the more complex marks (frequencies) of Chipping and Swamp Sparrows, I’m hearing differences in sound I don’t think I recognized before. I have high expectations that one day soon, I will be able to stand in the middle of Negri-Nepote, my favorite grassland preserve in New Jersey, picture these diagrams in my mind as I hear them, and KNOW the Pine Warbler from the Chipping Sparrow. The Warbler Guide Song and Call Companion is a highly recommended purchase for birders and naturalists who have bought or intend to buy The Warbler Guide. It will be, of course, especially useful to birders who want to improve their auditory identification skills and learn a new system for learning bird vocalizations. The Companion is not meant to be a bird song identification product by itself; it is a complementary product intended for learning and study. A lot of care has gone into designing its format, making it simple to download and use with the “parent” book. Yes, there is an extra cost involved, but I think the additional benefits to using the sound files with the book are well worth the investment. This is a good moment to point out that the authors and Princeton University Press have added some nice goodies to the free offerings supporting The Warbler Guide. In response to birders’ requests, PUP has made the stunning (and educational!) Quick Finders available for download. 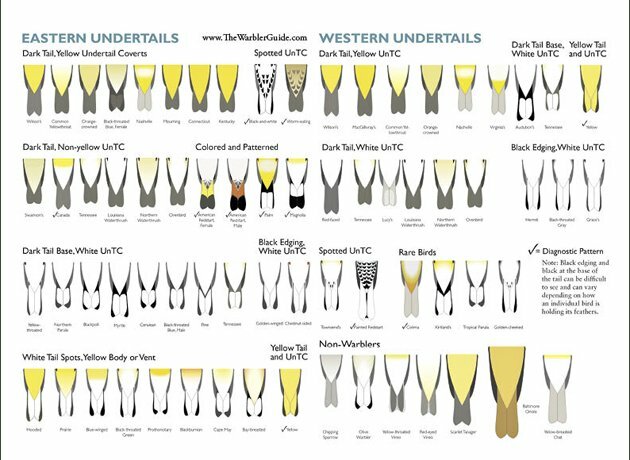 Catherine Hamilton, the book’s illustrator and bird artist supreme, drew the Undertails Quick Finder shown here. Catherine is responsible for the book’s graphics, including, I assume, the crisp icons at the beginning of each species chapter. I know this is being greedy, but for your next offering, PUP, how about a chart of the “color impression” graphics, those stylized, delightful birds that diagram out each warbler’s colors? Authors Tom Stephenson and Scott Whittle are also intent on giving good free stuff away. The book’s web site, The Warbler Guide, offers articles expanding on the book’s content, including “Often Overlooked ID Points” and “How to Memorize Warbler Vocalizations”. The site offers a calendar of Tom and Scott’s speaking engagements, including a workshop they will be doing at the New York Birders Conference on November 1st, in Uniondale, NY (western Nassau County). Well, they are doing many appearances in many places, but as a member of the planning committee for the conference, I have an obligation to plug it whenever I can. We will also be offering The Warbler Guide as one of our raffle prizes, a good alternative if you fail to win the book in Corey’s What Will Be Number 300 in Queens? giveaway. $5.99; purchase by downloading files. Thanks for letting us know, Donna! Based on your review, I asked for–and got–the Warbler Guide as a birthday gift, so I llook forward to tucking into it with the added bonus of the sounds. Cool stuff!